Just this week after Florida State Senator Ted Deutch (D-FL) won the Special Election in FL-19 “The Dog” claimed as well as the President, that Deutch’s Victory was a Referendum on the passed Health Care Reform Plan. 2. You would expect Democrats electing a Democrat in a STAUNCHLY PVI D + 15 District. So, they did a nice Spin Try on this. They both are fools. Yesterday we got the exceptional good News that Republican Charles Djou (R-HI) leads in the Hawaii Special Election. Today I just have to laugh at Democrat Mark S. Critz (D-PA) who is running in PA-12 to fill the partial Term of the late John Murtha (D-PA). This fool has to cut an TV-Ad distancing himself from the unpoplar Plan. Mark my words: The PA-12 will be a Referendum on the Plan and if WE win this Election we’re in very good shape for November. http://twitter.com/ppppolls/status/12351715333 and I quote: “Obama massively unpopular in the District, Race surprisingly close given that. So, I wouldn’t be surprised at all if Republican Tim Burns (R-PA) is leading here. This is a PVI R + 1 District BUT given that PA Governor Ed Rendell (D-PA) has put the Date of this Vote on the exact same Day of the Pennsylvania Primaries we’ve still a very uphill Battle here. Still, the initial Observation Jensen sees looks good for us. Yo Daniel!….my claim was the election was NOT connected to Healthcare….. which I think has passed its high point…The GOP wants to keep the fight over the Healthcare Bill alive …It won’t work.…. Also my mention of Lynch’s lack of money in the heavy democratic leaning district……. So how does the Site work? 1. Click on the Governors Races Link. 2. Then click on the Illinois State Page for example. 3. On that Page you’ll see that Scott is tracking the Governor, Senate as well as the Race in IL-10 and IL-14. As you can see Brady is currently projected by 8,5 % over Quinn; Kirk is projected by 4,0 % over Giannoulias, Dold is projected by 0,5 (very close indeed) over Seals and Foster is projected 3,5 % over Hultgren. Tacking for the Races will be initiated after the Primaries so keep an Eye on Indiana, North Carolina and Ohio after May 4th. I know this is for 2008 but it’ll be updated shortly. Scott is using Polls and most importantly Pundits for his Projections. A Pundit for example is weighted 100 % while a State Poll is only weighted 50 % so IF for example Cook shifts Arkansas into Leans Republican that’s more weighted than the latest State Polls. I know it’s sometimes confusing but that’s how it is. Apple and Political Satire software Application's …….. The Dog is a Mac user true and true….Have been over 15 years….. So sometimes to it’s good to push the ‘brand’ and sometimes it good to put ‘other’ views out there…. This from the Washington Post.. on the Apple tendency to be bit close minded….. The saga of the Rejected Political-Cartoon App rears its head again. Only this time, the heat of a Pulitzer has helped stoke the fires of controversy. On Monday, Comic Riffs spoke with political animator Mark Fiore…… about his iPhone app that he says Apple rejected back in December. That rejection might have been end-of-story. Except that coverage of his Pulitzer win cast a spotlight on the app rejection. And in a case of conspicuous timing, Apple suddenly has urged Fiore to resubmit his app, the cartoonist says. Haven’t we been down this road before? And more important: Hasn’t Apple yet decided how to resolve the larger issue of political satire apps instead of suffering PR black-eyes with each skirmish? Both questions, of course, are rhetorical. On Monday, Fiore and I even discussed Richmond’s initially rejected app — as well as the initially rejected app of political-cartoon syndicator Daryl Cagle — after Fiore mentioned that he’d had an iPhone app (titled “NewsToons”) rejected. Apple and Political Satire software Application’s ……..
Back in January I vistited my friend Scott Elliott over at “Election Projection”. His Site is really MARVELLOUS and will be updated throughout the year until November. The Projections are based on Polling BUT with an Election Formula that you can find on his Website. It’s similar to “Daniel G’s Projections” although I’m doing it slightly diffencent as I have a little more tools than him. Still his Site is great and I’ve used it as first place to start my own Projections. Please visit his Site often for Updates. The President’s wife has just successfully finished a major Diplomatic trip to Haiti and Mexico…..
To her credit she is almost as popular as her husband…and her trip seems to have a major success….. Which is a huge plus for the United States……. Mexico a country that is portrayed as the home of illegals, and drug dealers…..got a welcome light moment from the media with the trip…….. 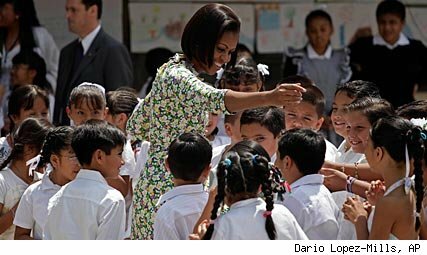 Thank you for allowing me to use your stories,” First Lady Michelle Obama told the dozen student leaders seated around her at a big rectangular table. It was Thursday morning at a beautiful event site, a 16th-century former Spanish hacienda, a reminder of this nation’s colonial era. Each of the students had a personal, passionate story to tell Mrs. Obama. The six men and six women, from different parts of the country, were picked by the U.S. Embassy in Mexico to come to the capital for a roundtable discussion. A State Department translator sat next to Mrs. Obama whispering to her in English as another translator across the room (at a table walled off by glass) turned Mrs. Obama’s words to Spanish, transmitting them to ear pieces everyone wore. The personal narrative is a central part of the Obama ethos. Encouraging people to tell their stories is a tool that a young community organizer, Barack Obama, used on the South Side of Chicago. President Obama introduced himself to much of the world one summer night in Boston in 2004, when he told his own. “I stand here knowing that my story is part of the larger American story, that I owe a debt to all of those who came before me, and that, in no other country on earth, is my story even possible,” Obama said in his famous keynote address to the Democratic National Convention. Asking people to share their stories was a centerpiece of the Obama presidential campaign field outreach effort. In the successful drive to pass a health care reform bill, having people tell personal tales of being short-changed by their insurance company was part of the grassroots campaign run by Democrats and their allies. So now Mrs. Obama, too, is collecting stories as she moves ahead with her agenda. The event at the hacienda never became a real discussion; it took time just for each of the 12 to explain their projects. Mrs. Obama lavished them with praise. Note……The ‘last minute’ trip to Haiti …..was actually in the works for months……. President’s and their wives very seldom travel anyplace outside the United States on ‘the spur of the moment’ anymore…..